Arodius is a new dual-stick overhead survival shooter released by Mobile Force. While gameplay is generally consistent with other games within the genre, there are several aspects of Arodius that sets it apart. First is gameplay. Fans of the genre will be familiar with the dual-stick controls. Arodius also has an “ultimate attack” between the two pads that can be unleashed when its meter is full. There are 5 worlds, each with 6 levels. 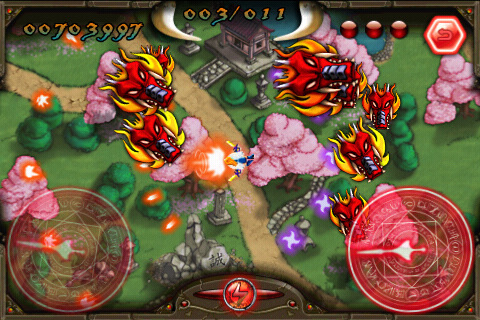 Within the levels, enemies are sent in waves, entering the playing field from above and they drop different weapons, allowing you to upgrade or switch your weapon. The amount of enemies in each wave will depend on the difficulty you select, with Easy starting out with 5+ enemies to Nightmare, which has 18+ enemies. There’s also a leaderboard for the competitively-inclined. Second are the graphics and theme. You are a “God” with unlimited power who has set out to find “the sisters.” Arodius follows a vague fantasy storyline whose only purpose is to allow for gratuitous cut scenes of disproportionately-endowed and scantily-clad characters who were deemed saucy enough for Arodius to garner the 17+ rating. Arodius also seems to use this as an incentive to keep playing since the further you progress, the less the final bosses are wearing. What the cut scenes have in quality, detail and vibrance, the game is somewhat lacking. All of the sprites are fixed and 2D, making what is typically an intense, high-paced game feeling pretty flat. Another poor design element is Arodius’ use of the same icon to indicate pause, menu, back and enter. Though it wasn’t hard to figure out, minor details like that or spelling errors will reflect largely on an app when it’s competing with countless others in its field. Arodius has a gallery section where the images you unlock are saved. Given Arodius’ repetitive gameplay and its overall dull and lacking in-game animation/graphics, those anime-esque pinups arguably wind up being the game’s biggest selling point. Arodius can be found in the AppStore for $2.99 and occasionally goes on sale for $0.99 but if you’re still hesitating, there is also a Lite version that you can sample before taking the plunge. AppSafari review of Arodius was written by Aucoeur Ngo on March 12th, 2010 and categorized under Action, App Store, Fun, Games. Page viewed 3716 times, 1 so far today. Need help on using these apps? Please read the Help Page.